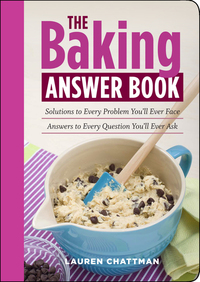 Sample recipes from the book include Green Chile and Cheese Stuffed Chicken, Sunday Pot Roast and Honey Chipotle Meatloaf. The recipes are divided into chapters of cook or prep time-25 minutes or less to cook, 45 minutes or less to cook and 5-10 minutes to prep. Readers also get stress free weeknight desserts, such as Layered Cheesecake Cups, One Bowl Chocolate Peanut Butter Cake and 5 Minute Soft Serve Strawberry Ice Cream. Since Mary's son has a sensitivity to gluten, the desserts include gluten-free adaptations, perfect for families in similar situations. Cooking from scratch is healthier and cheaper than eating out, and it has a way of bringing families closer together. 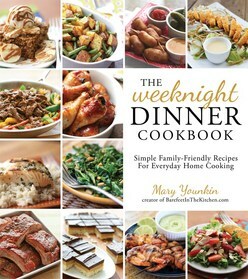 The Weeknight Dinner Cookbook helps families eat at home during busy weeknights without stressing about cooking; they save money, eat good food and spend more quality time together. Amazing stress free meals from scratch to feed your family throughout the week from a blogger with over 200,000 Facebook fans. The Weeknight Dinner Cookbook isn't just for people who want everyday quick & easy recipes; it's for those who want to take cooking from scratch to the next flavour level. The 100 recipes in this cookbook fit the bill - they are simple, quick to cook or prep and out-of-this-world delicious. Don't believe us? 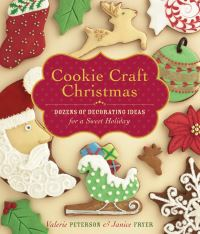 Just take Mary Younkin's large audience as testament to her skill - she has a following of over 200K fans on Facebook. Her recipes are easy to make, don't require fussy hard-to-find ingredients and always have a unique flavor element that makes them mmm-mmm good.